The thing that attracted me to this recipe was not just that I magically had all the ingredients – (except the green chilli but I made up for this by adding a daring spoonful of chilli paste to the sauce; I substituted kumara for butternut because that’s what I had) – but that the combination of flavours seemed so new and yet so obviously meant to be together. 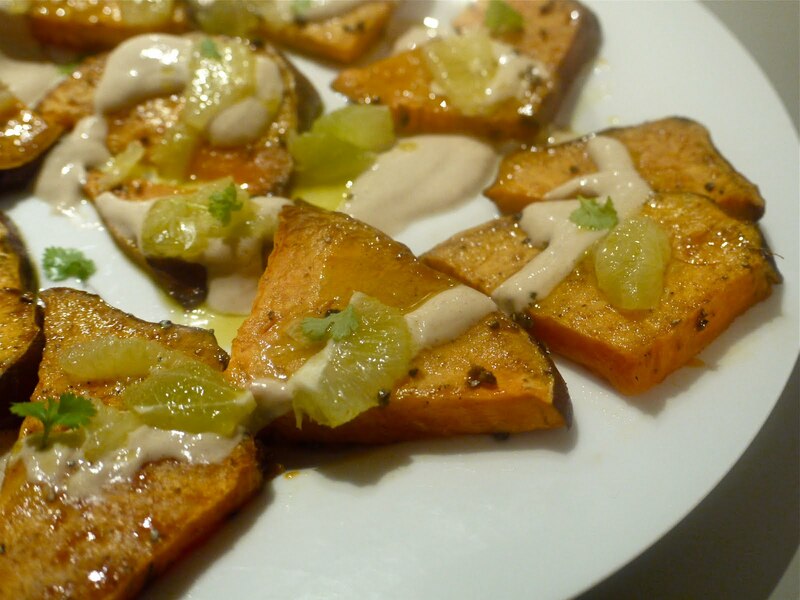 I’d never had cardamom like this before or poured tahini over kumara. I wanted to try it, and immediately. Adapted from a recipe by Yotam Ottolenghi from his book Plenty, in the July Cuisine magazine. Preheat oven to 210 C. Trim the tops and tails off the limes, stand on a chopping board and carefully slice off the peel and pith (a bit like this recipe here). Quarter the limes from top to bottom, and cut each quarter into thiin slices (basically – you want really thin slices of lime. The instructions are a little fiddly.) Place the slices in a small bowl, sprinkle with a little sea salt and pour over one tablespoon of the olive oil. If you have a really, really nice olive oil this is the place to use it. Cut the butternut or kumara into slices about 1cm thick. Lay them on a baking tray. Grind the cardamom pods in a pestle and mortar (or you could probably use a food processor or something) so the seeds are extracted, and then discard the greenish pods (this took forever! The recipe does not mention this fact!) and continue to work them into a rough powder. Add the allspice and remaining oil (I used only about a tablespoon or so) and brush over the slices, sprinkle with a little salt and place in the oven for 15 minutes or until tender. Remove from the oven. Meanwhile, whisk together the yoghurt, tahini, a tablespoon of lime juice squeezed from one of the slices chopped earlier, 2 tablespoons of water and a pinch of sea salt. To serve, arrange the slightly cooled slices of butternut or kumara on a plate, drizzle with the yoghurt sauce, spoon over the lime slices and scatter the coriander and chilli over the top. These flavours together were so stunning. After one mouthful I involuntarily cried “Damn this is good!” and defied anyone within my empire (Tim) not to agree with me. Luckily he liked it too. 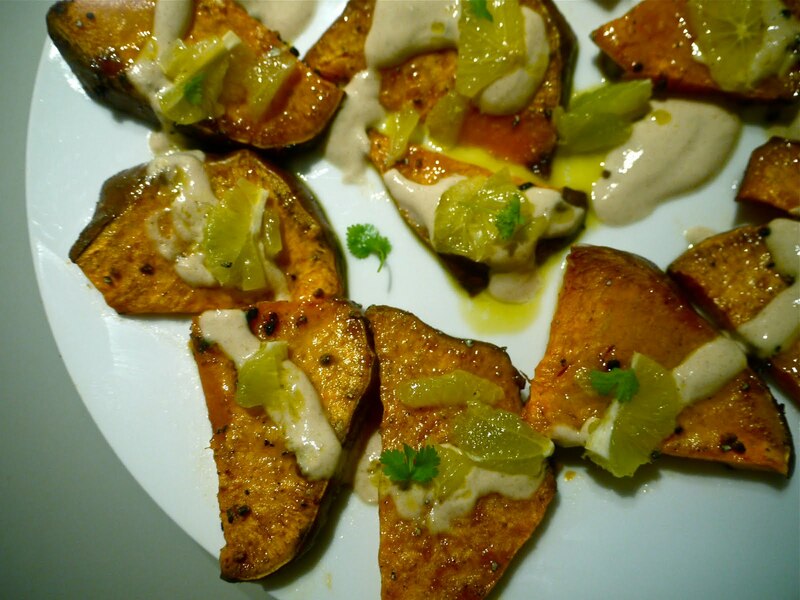 Here’s what this plate is serving you: the soft, satiny, caramelised slices of sweet kumara, roasted with lemony, tongue-numbing cardamom and cooled with earthy, nutty, tangy yoghurt and tahini sauce. The wince-inducing sharpness of the limes is somehow softened during their brief olive oil and salt spa session, leaving only pure, juicy lime flavour. You know what perky lift the coriander brings, that’s why it’s so popular. The chilli that I added into the sauce brought a little necessary dark heat. We had this with rice and it was a small but perfect dinner for two. You could leave out the yoghurt and make this completely vegan or serve it alongside a gingery roasted chicken or sesame and soy-marinated steak. It’s something special all right. So special I wheeled out alllllll those adjectives. On Monday Tim and I were fortunate enough to see Wanda Jackson performing live at the San Francisco Bath House. At 75 years of age her voice is as menacing as it ever was and she put on an amazing show, revisiting old favourites (Let’s Have A Party – hooo!) and new zingers, with stories of how she got to be where she is. Afterwards she appeared on the floor and waited patiently to sign photos for everyone, Tim and myself included – we got squeezed to the back by some understandably, but undeniably pushy folk so she looked a little dazed by the time our turn rolled round, but was still friendly. She’s often mentioned in conjunction with dating Elvis and for Jack White producing her next album but far from being defined by the men in her life she appeared on stage as who she is – an incredibly talented, powerful, gracious woman. Title via: Craig Mack’s superfine Flava In Ya Ear from Project: Funk Da World. Wanda Jackson’s devastatingly good Shakin’ All Over, produced by Jack White for Third Man Records. On Monday night Jackson was wearing this white, heavily fringed sweatshirt (it reminded me a little of a pink sweater I used to have as a kid with a giant purple fringed V-shape across the front, I called it my “Barbie Goes West” outfit because I was cool like that) which she used to great effect in performing this song. I love it! Devo’s new-ish song Fresh from their album Something For Everybody. I do love a song that exercises its right to multiple tempos and both Fresh and Shakin’ All Over do this staggeringly well. Those look ridiculously good! Want! Looks delicious. We love Ottolenghi too! Check out bookdepository.co.uk for their books – great prices esp at current exchange rates and free delivery. Libby and Becs: thanks for the heads-up! Hi, am going to make a pumpkin version of this over the weekend, looks delish, made the Lime Banana loaf last night, what a treat for morning tea, you are so right about the icing, yummy! And Wanda! She's so cool. I was so giddy and excited after getting to say hi and get her autograph. I hope I'm half as awesome when I'm her age! 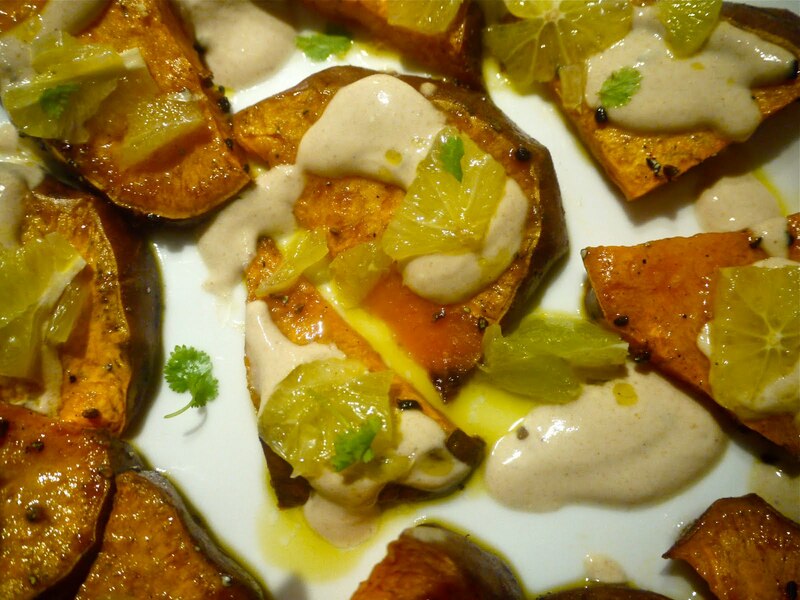 Butternut Squash – was there ever a nicer and more versatile winter vege? My current favourite recipe (soon to be surpassed by yours I expect!) is from the irrepressible Hugh Fearnley Whittingstall – stuffed and baked with garlic, blue cheese, walnuts, thyme and topped off with honey. Delicious! Ottolenghi, until recently, wrote the vegetarian food column in the weekend Guardian. Some brilliant recipes! In fact, my dinner last night was courtesy of Yotam. I tell you what, the Wanda Jackson story would be even better if she was dating Jack White and Elvis was producing her next album. Hurrah! I have a new computer!